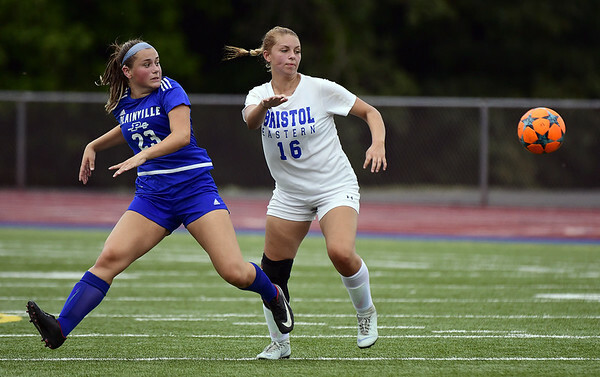 BRISTOL - If the game-winning goal against Bristol Central in Plainville’s first game wasn’t enough, Krystyna Miller’s performance against Bristol Eastern on Tuesday showed off her potential for greatness. Miller showed off a dynamic offensive game, using her ball skill to work around defenders and her passing ability to open up the field for her teammates. It resulted in five goals for the sophomore that Plainville knows has the potential to be a star player. Miller’s offensive ability should provide the Blue Devils with the scoring punch they lacked desperately last season, being shut out in eight of their games. Plainville believes this is going to be a good season and No. 23 in blue will be the player to watch on offense for the Blue Devils. Posted in The Bristol Press, Plainville on Tuesday, 11 September 2018 21:40. Updated: Tuesday, 11 September 2018 21:43.